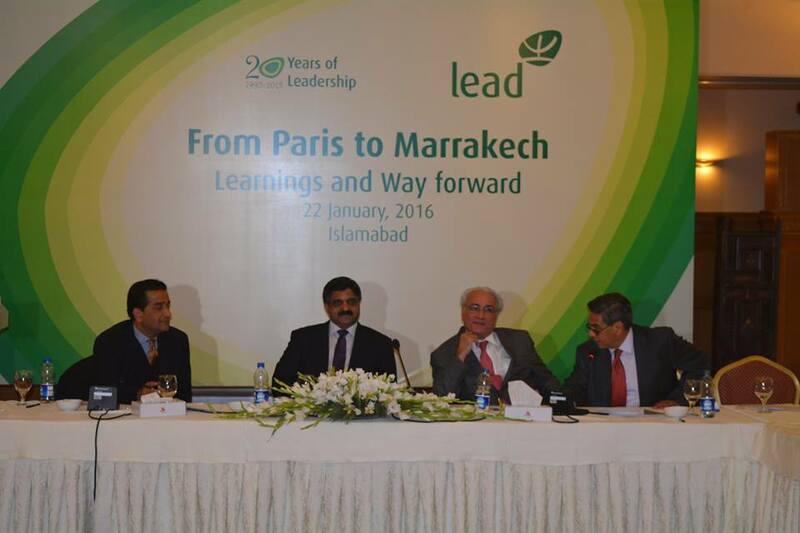 Islamabad: Leadership for Environment and Development (LEAD) Pakistan organized a debrief on COP21 for high ranking government officials, development practitioners, media professionals and relevant stakeholders to discuss the outcome of COP21 and way forward. Mr. Arif Ahmed Khan, Secretary, Ministry of Climate Change, was the chief guest at the occasion. 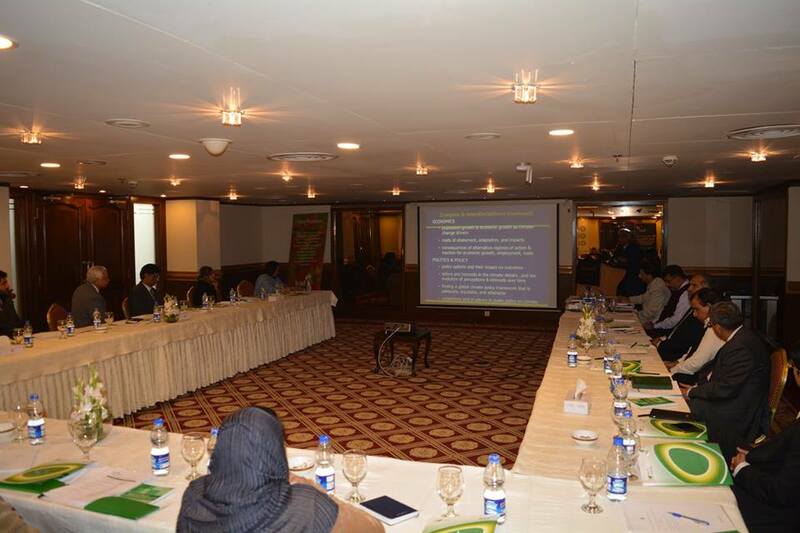 Ms. Hina Lotia, Director Programmes, LEAD Pakistan, welcomed the participants and highlighted the objectives of debrief and the deliberations. It is important to note that COP21, also known as the Paris Climate Conference, which began on November 30, 2015, and ended on December 12, 2015, successfully reached a historic agreement to combat climate change. Ali Tauqeer Sheikh, CEO, LEAD Pakistan, and Director Asia, Climate & Development Knowledge Network (CDKN), gave the inaugural remarks and shared that the Paris Climate Agreement was ratified by almost 200 nations. He hoped that it will help to keep temperature rise below 2 degrees Celsius and also contribute towards efforts to limit the temperature increase to 1.5 degrees Celsius above pre-industrial levels. Maj. Gen. Asghar Nawaz, Chairman, National Disaster Management Authority (NDMA) gave a keynote address and highlighted NDMA’s role in adapting to climate change and how DRR (disaster risk reduction) is being looked from the preparedness and resilience perspective. 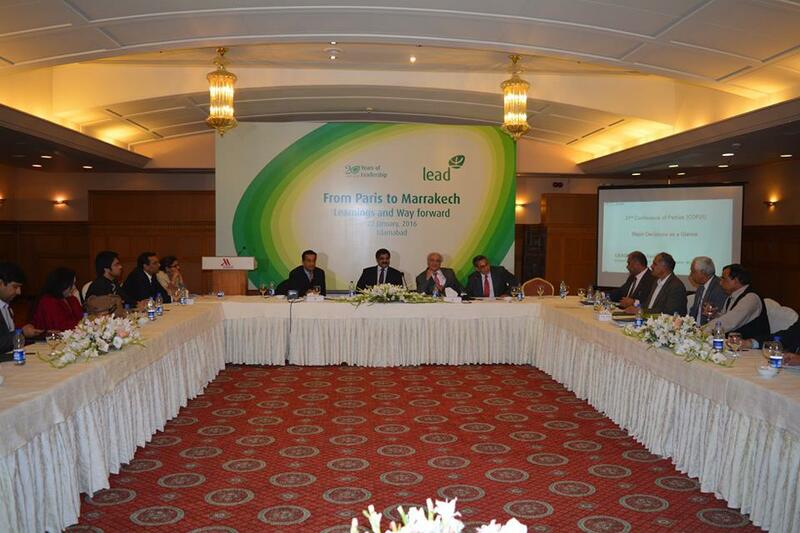 Key decisions on COP21 were discussed by experts including Mr. Ali Tauqeer Sheikh, Mr. Malik Amin Aslam, VP Global IUCN and Chair KP’s Green Growth Initiative; Ms. Aisha Khan, CEO, MGPO; Mr. Nadeem Ahmad, Policy Analyst, LEAD Pakistan; Dr. Ghulam Rasool, DG, Pakistan Meteorological Department (PMD) and Mr. Syed Mahmood Nasir, Inspector General Forests (IGF). Later, Mr. Ali Tauqeer Sheikh moderated the discussion ‘Towards Marrakech: Opportunities & the Roadmap for Pakistan’ and also explained that how Pakistan can best leverage decisions from COP21 to serve as drivers of development in an increasingly climate vulnerable world. An interactive Q&A session was also held whereMr. Ali Tauqeer Sheikh, Mr. Arif Ahmed Khan, Malik Amin Aslam, and Maj. Gen. Asghar Nawaz, responded to various questions pertaining to Climate Change and how Pakistan can be made resilient to its impacts and effectively positioning itself at the future Climate Summits.